I Found The Biggest Jeep Fans In The World, And They're Not In The U.S.
Pereira, Colombia — "It's a Jeep thing, you wouldn't understand." If you've ever been interested in Jeeps, you've probably heard that said or seen one of those boastful stickers plastered across someone's windshield. Or maybe you have one of those boastful stickers on your Jeep. But there's something you should know. The biggest Jeep fans are American, but they're not from the United States of America; they're from South America. While a few American (that's North American) Jeep aficionados occasionally thrash their 4x4 toys on the trail, many Jeep owners relegate their army truck descendants to lives of suburban commuting and mall parking lots. Not so in Colombia's Zona Cafetera, where your last cup of coffee may have originated. Those old Jeeps are shown off and put to work. Jeeps began showing up in Colombia and other developing countries after the Korean War, when the U.S. government had a bunch of war surplus Jeeps it needed to get rid of. It sold them, cheap, and when I traveled to Santa Rosa de Cabal, Colombia one morning, I saw scores of them, parked in rows and ready for another day's work. 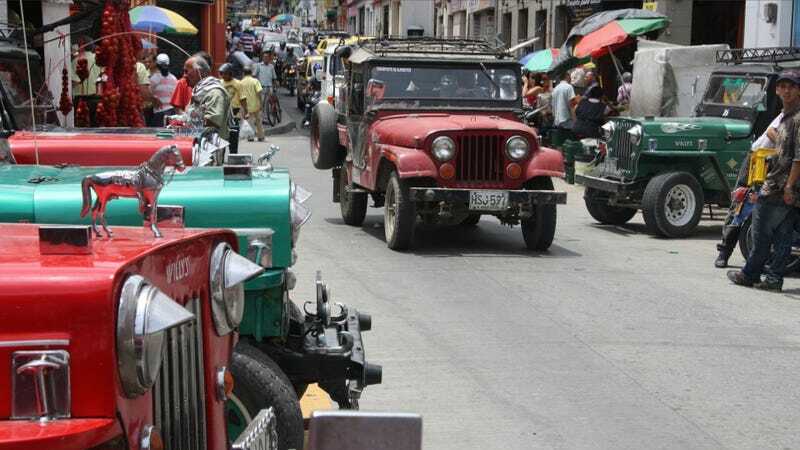 But travel down the main street of any town in the Zona Cafetera, and it will probably be lined with Willys Jeeps from the 1950s and later, too. These old workhorses aren't kept around for hobby, they're put to work on a daily basis, lugging huge loads of coffee, beer, growing supplies, and tourists up and down steep mountain inclines. And when I say lugging, I mean chugging, because most of these Jeeps have their original four-cylinder mills (although many drivers have made the switch to natural gas, which is much cheaper there). Fast they are not, but when it comes time to haul supplies up and bags of coffee down (and loads of tourists both ways) from the coffee triangle's picturesque hamlets, these old Jeeps always come through, even if their drivers have to stop from time to time to fix things (I was part of a load of tourists and we had to stop when one of the truck's bald tires blew out). Willys Jeeps are celebrated in this part of the world on a daily basis, and most of them have accumulated touches of personal flair such as chrome animals, decals, and custom paint jobs over the years. There's also an annual festival, the Desfile y Concurso del Yipao in Calarcá, to show off the little trucks' capabilities through contests (Yipao is a bastardization of the Spanish pronunciation for Jeep). Jeeps compete in the following contests, dressed to the nines, of course, with lots of bright paint and chrome trim. 1. Heavyweight Champion: Each Jeep carries nearly 4,000 lbs. of coffee inside, weighted toward the back until the front wheels no longer touch the ground. The drivers then see how far they can go without the use of their steering gear. 2. Coffee Caballeros: Participants are judged on how well they can carry agricultural products such as coffee, bananas, yucca, firewood, mangos, and all kinds of other things. Style points are key here. What can your mango do for you? 3. Macho Movers: On moving day, there's only one way to get all of your stuff to point B; in a Yeep. Pots, pans, couches, clothes, and even chickens are piled on top of the diminutive 4x4s during this contest. If you have a really nice portrait of your Tio Alberto laying around in the attic, this would be a good time to dust it off and touch up its gilt frame. 4. Freestyle: This category gives participants the opportunity to transport something, anything; everything from shoes to an entire soccer team have made the trek. Most of the year, though, Coffee Country Colombians engage in a quieter type of Willys Jeep worship. It comes as proud, sidelong glances at the old trucks, or the way someone's voice fills with warmth when they say mi Willys! Apart from being a reliable (that means easy-to-fix) workhorse, they're also a cultural institution, passed down from generation to generation, and once bought, not sold for years. They become like members of the family. There are certainly people in the U.S. of A. who revere their Jeeps in the same way, but trust me when I say that there aren't as many per-capita as in Colombia's coffee country. Most of us — and until recently myself included — have no idea that the heart of Jeep Country isn't in the U.S., but in South America's green mountains.